Is Ron Paul the victim of a media blackout? The Republican congressman and 2012 presidential candidate was shut out of the Sunday public affairs shows this past weekend despite his neck-and-neck second place finish to tea party favorite Michele Bachmann in Saturday's Ames, Iowa straw poll. He was likewise excluded from most of the second-day newspaper headlines about the preliminary political contest, leaving some news watchers to question whether Paul is receiving unfair treatment from the mainstream press. "Ron Paul just got shafted," Politico's Roger Simon wrote on Monday. "Why didn't Paul get the same credit for his organizational abilities as Bachmann did for hers?" "This pretending Ron Paul doesn't exist for some reason has been going on for weeks," said "Daily Show" host Jon Stewart in a segment Monday night that skewered coverage of the libertarian-leaning candidate. "How did Ron Paul become the thirteenth floor in a hotel? ... 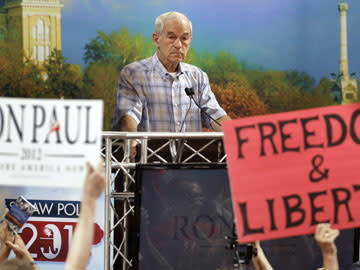 Even when the media does remember Ron Paul, it's only to reassure themselves that there's no need to remember Ron Paul." Paul's spokesman, Jesse Benton, told the congressional newspaper The Hill Monday night: "It is a travesty that Dr. Paul was ignored after his near statistical tie and historic vote total. However, in our view, the networks could quickly and easily rectify this situation by having him on the coming week." In an e-mail to The Cutline, Benton said the campaign had "seen an increase in media attention because so many American's have been outraged, and rightly so, by Dr. Paul's dismissive treatment. Citizens from across the country have been reaching out and demanding that the media cover Dr. Paul. And it is helping." As for MSNBC, "We have a standing request into the Paul campaign for the candidate or a surrogate," a spokesman for the network told The Cutline. "A surrogate was booked on Monday, but backed out. We were told that Paul was not available." Betsy Fischer, executive producer of "Meet the Press," said in an interview with The Cutline that Paul declined an invitation to appear on the post-straw-poll edition of the show when it was extended to him three weeks before the event. Will another invitation be extended in the future? "We have no invitation pending, but we certainly wouldn't rule it out," Fischer said. Likewise, "We look forward to having him on 'This Week' in the future," said Heather Riley, a spokeswoman for ABC News. A spokeswoman for CBS did not immediately respond to a request for comment. Some commentators, meanwhile, are dubious about the notion that Ron Paul is somehow "getting screwed," as Salon's Steve Kornacki put it, by the news media. "Those who believe Paul is getting a raw deal seem to assume that there should be a direct relationship between a candidate's straw poll performance and the level of media attention that candidate receives as a result," Kornacki writes. "The problem is that the straw poll isn't really about the literal order of finish. It means different things to different candidates for different reasons." He continues: "The experience of 2008 demonstrated that it's very easy to exaggerate the breadth of Paul's support -- and that his views (particularly on foreign policy) are so far outside the GOP mainstream that the party establishment will go to great lengths to make sure it doesn't expand beyond his base. That still seems to be the case today." Eric Zorn of the Chicago Tribune agrees. "In short, no, he will never be president of the United States and no, he is not a plausible contender for the GOP nomination, so those who are covering the campaign don't feel obliged to pretend otherwise," Zorn writes. For Paul's part, he doesn't seem to be letting the lack of coverage slow him down. When asked by Politico's Simon about the "media blackout," Paul replied: "It did disturb me, but it was not a total surprise. The result at Ames was significant; it might well have propelled us to the top tier. The media cannot change that." In this afternoon's Fox News appearance, Kelly asked Paul flat out if he feels as if the media is ignoring him. "Sure. Yeah, they are and we need to ask them why," he replied. "I mean, what are they afraid of? We're doing well, we're certainly in the top tier, we did well in Iowa and we have a good organization, we can raise money. But they don't want to discuss my views because I think they're frightened by us challenging the status quo ... because my views are quite different than the other candidates', so they would just as soon us not get the coverage the others are getting and they will concentrate on establishment-type politicians."